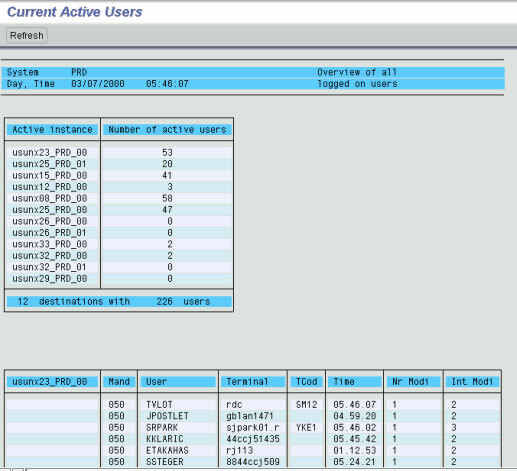 This transaction code shows a list of all user currently logged on to the SAP system (all app servers). This transaction codes will display table locks. This transaction code will display the enqueue locks. This transaction code is used to see the system log files. After you have filled in your selection make sure to choose system log, choose, all remote system logs before you hit the read log button. This transaction is used to schedule a background job. This transaction code is used to display background (or batch) jobs submitted by users. This transaction code is used to display all the work processes on the current apps server. This transaction code is used to display a list of all the running apps servers. There should be 12 apps servers running at all times. By double clicking on one of the servers in the list, you will then see a listing off all the work processes on that server (same as using sm50). Note: you will also connect to that server. This transaction code will display a list of all current running work processes on all the apps servers. It doesn’t refresh itself automatically so hit or select the refresh button located at the top. The list can be sorted by selecting a column and hitting the sort button located at the top. If you select the detail analysis menu using the button in the top bar you will see the screen shown below. Here the button info mix session is very useful because the screen it brings up will help you map the PID to the SID. You can able to see all t code details in SM21 with * (Star). You will get all Transaction logs with user name and t code wise.